The following are provisional data collected and displayed directly from instrumentation in Senator Beck Basin. These data have not undergone rigid quality control procedures, and should be used solely for informational purposes. 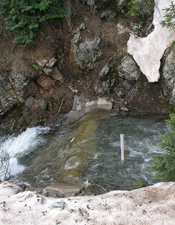 The CSAS’s Putney Study Plot (PTSP) is located outside of Senator Beck Basin, proper, approximately 1 km southwest of Red Mountain #3 and 1.5 km east-southeast of Red Mountain Pass on the ridge crest dividing the Mineral Creek and Cement Creek watersheds. 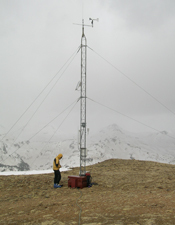 Because of its high location on a small summit at 12,325′ (3756m), PTSP monitors atmospheric conditions which are comparatively uninfluenced by local terrain. 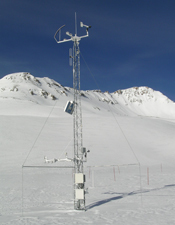 These “free air” measurements are considered representative of the general wind conditions in the Red Mountain Pass and Senator Beck Basin vicinity, and of ambient air temperatures at that elevation. 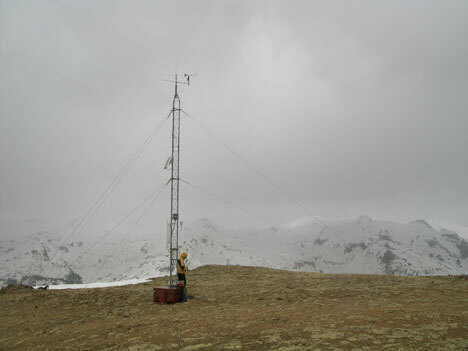 Wind speed and direction (RM Young™ Model 05103-5) are measured every five seconds at the top of the 30’ tower and air temperature and humidity (Vaisala™ HMP35-C) are measured every five seconds at 10’ above the ground (and not closer to the ground, in order to protect the sensor from blowing snow, pebbles, and other flying debris during strong wind events). Those five-second measurements are averaged each hour to generate 1-hour data, and once every 24 hours, at midnight, to generate 24-hour ‘summary’ data using a Campbell Scientific™ CR10x datalogger. Times reported are in Mountain Standard Time; we do not utilize daylight savings time. 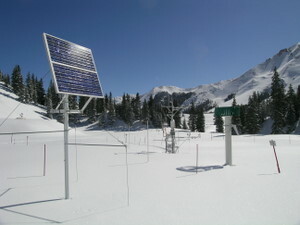 Data is collected by the CSAS via RF link and is also utilized by the Colorado Avalanche Information Center for their US Highway 550 avalanche forecasting program. We are grateful to the Putney site landowner, Tronox LLC, for enabling the ongoing utilization of this excellent site for research and public safety purposes.